Today Im going to review the HD Mineral Foundation by Luscious Cosmetics which I have bought couple of months ago and since them Im using it and quite satisfied yet amazed with the result and the product too.I have been using it for about a month or two so now finally able to do a review about & hoping you will find it helpful for you . Mineral makeup products are made from natural minerals derived from the earth or the ocean, and are formulated without fragrances, binders, synthetic dyes, and preservatives that are present in standard makeup formulas. This means that mineral makeup formulas are much gentler on your skin, ideal for all skin types, even sensitive skin, and actually improve the texture of your skin as you continue to use the product. It is the ideal balance of makeup+skincare and helps your skin retain a healthy water balance while minimizing pores and evening out skin imperfections. Luscious says that this High Definition Mineral Foundation is a silky, lightweight foundation made from pure minerals with all the benefits of a skincare treatment. The soft-matte formula is infused with minerals, vitamins and deep sea water. Glides onto your skin for perfect coverage, and evens out your complexion while allowing your skin to breathe. Continued use will make your skin smoother and clearer, even when you're not wearing foundation! This foundation has been specially formulated to provide all the benefits of mineral makeup without compromising on coverage or staying power, and minimizes pores and imperfections for a high definition finish. It comes in 7 shades . Click Here to check them out . I totally love this foundation when at first I applied it , it has sheer and quite natural coverage but yeah you do need to use concealer after setting up a foundation for under eye circles and blemishes IF ANY . My pores got minimized and the skin was looking completely flawless and my skin was completely matte without appearing cakey and it was feel like I haven't applied any makeup. It has sheer coverage but you can built it up to get a medium coverage but DON'T forget to conceal your blemishes and under eye bags and a your compact powder to set up the foundation , as Im a sheer and natural coverage lover I didn't layer it up 2nd time, only one layer is pretty enough for me . After using a HD foundation and I conceal blemishes and under eye bags with their Secret Studio Concealer and at last set it up with my compact powder and that given me completely flawless , matte (as I applied my matte finish compact powder) and natural look . This foundation is moisturizing and quite long lasting and a light weight , after applying it you are not going to feel that you have applied on your face. If you are matte finish lover , then set this foundation with your matte finish compact powder and you ll get a matte finish look . It has dewy finish which does light reflecting part really well . I have it in 'Sand' 1.5 which goes with my complexion really well . Luscious HD Mineral Foundation comes in 30 ml bottle with pump and packaging is simple yet stylish . Over all its a great product and great buy . 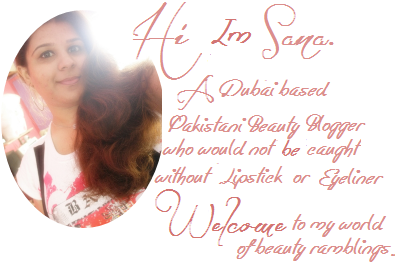 This foundation comes under a price tag of 1175 PKR which is quite reasonable as it is a mineral foundation . You can get it from any good cosmetic store nation wide or place your order on their website , Click Here . I got mine from ISM . I concluded that it is best for dry to normal skin types. I would not recommend this to people with oily/combination skin types. What you think about it? Have you tried it yet ? 6 comments on "Luscious HD Mineral Foundation [Review&Swatches]"